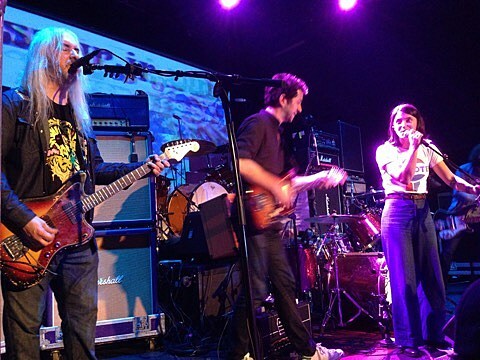 Dinosaur Jr. pulled out some big guns for their penultimate show of their seven-night 30th anniversary run at Bowery Ballroom. Most notably: Kevin Shields of My Bloody Valentine who came out to play guitar on a cover of MBV’s “Thorn” which Lou Barlow, clearly insanely psyched, sang lead. “This went great at rehearsal,” Lou said after a false start. It went pretty good at the show, too. They are old friends: My Bloody Valentine played one of their first U.S. shows with Dinosaur Jr, and then they toured together on the 1992 Loveless trek. Video of “Thorn” is below. – Sharon Van Etten, wearing a t-shirt that had “Peyote” in the style of an old Pepsi logo, came out for “Get Me.” She seemed a little sheepish, but it was great. 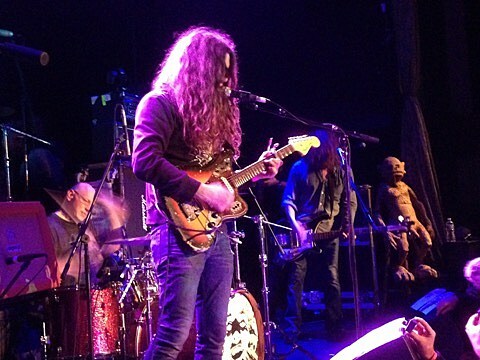 – Kurt Vile made his second appearance of the run, again doing “Crumble.” He spent most of the show at the side of the stage, bobbing his head. – Right after Kevin Shields, Mike Watt came out to end the main set with covers of The Stooges‘ “TV Eye” and “Funhouse,” both of which were awesome, maybe the emotional highpoint of the night. 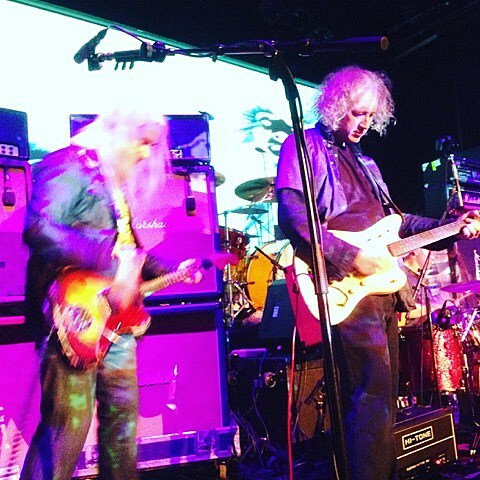 – Kyle Spence, who plays with J. Mascis & the Fog, played on Bones, the first real song of the set. 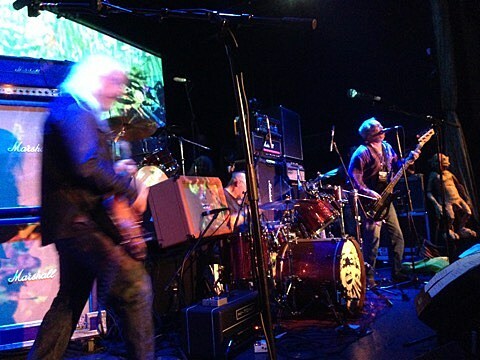 – Dinosaur Jr superfan Lee Ranaldo didn’t perform tonight, but watched most of the show from the side of the stage. – Tonight’s encore take on Neil Young’s “Cortez the Killer” featured Shields and Vile, ran 10 minutes and was a bit of a mess. Vile had guitar issues, swapped out like three times. It seemed like he was going to sing lead, but then Lou took over and did an admirable job. Video is below. – I was at Deerhunter beforehand and got there just in time for the second set. What did I miss? Theremin master Eugene Mirman opening the 2nd set of @dinosaurjr's 6th night of seven 30th anniversary shows. Kurt Vile now out with @dinosaurjr for "Crumble"